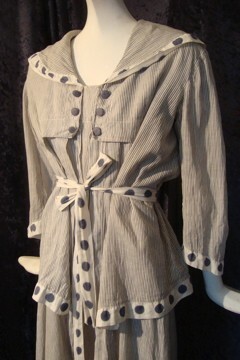 I am a seaside girl at heart, and I have loved having vintage nautical clothing in my collection. I hope you love these as much as I do. 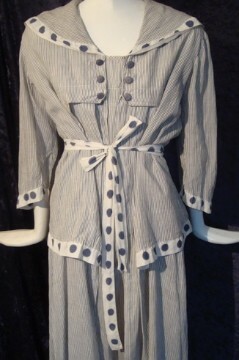 In this auction, you are bidding on a vintage Edwardian seaside dress fashioned of a lightweight cotton with navy and white stripes with accents of navy polka dots on white ground with navy cotton covered buttons. Great design as well. 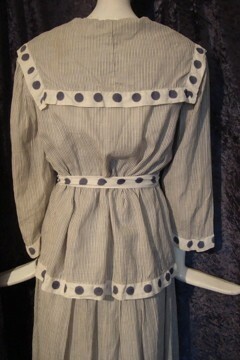 Faux over jacket cinched in the back with polka dot belt cinching in the front. This is so cute! Definitely a summer "play" outfit and most likely meant for the seaside. 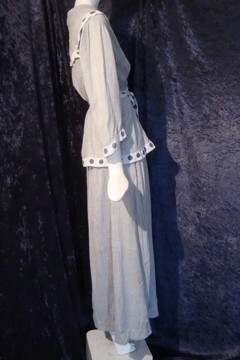 My guess is about 1912 or around there given the sleeves and the details on the bodice.